Let’s just say that I have been waiting for this movie since I walked out of MI: 4 Ghost Protocol. I wasn’t as enamored of the three MI predecessors, though enjoyed them for the most part. But, with Brad Bird at the helm, Ghost Protocol was energized with a humor and joie de vivre that blew fresh air into the franchise. So, how did Mission: Impossible – Rogue Nation do as a follow up? Is it worth a look see? I can answer only with a resounding heck yes!! Ethan Hunt (played by Tom Cruise) is in London and on deck for his next mission when he discovers that a nefarious shadow organization he has been tracking, namely The Syndicate, is real — setting Ethan on the path to take them down. Meanwhile, CIA Director Alan Hunley is seeking to dissolve the IMF for sins previously committed. This leaves Ethan in the wind, and on the run. Intrigued? How does this all unfold? I don’t want to spoil too much, so see the movie! The stunts and chase scenes will take your breath away, and might make you laugh out loud too. Christopher McQuarrie as scribe and director, keeps the action taut and the waste at a minimum. Smartly injecting a few quick references and visuals from previous missions, Rogue Nation still remains enough of a stand- alone to attract newbies by saying “here’s what you missed so far…” However, I must admit that I wasn’t exactly sure who the titular Rogue Nation referred to – The Syndicate or IMF. What I found most interesting is that McQuarrie allows Ethan Hunt to grow a bit weary during this mission. As the sole believer in The Syndicate, Ethan understands this is truly up to him to resolve. But, it seems like he wishes that it wasn’t up to him all of the time! With Simon Pegg’s Benji Dunn as the stand out support in achieving all things impossible, the other IMF alums aid Ethan, though it’s too bad that it’s not quite the team effort evident in Ghost Protocol. I was glad to see the return of Luther Stickell, played economically by Ving Rhames. Jeremy Renner makes the most of his scenes as the bureaucratic, nagging William Brandt. An unknown to me, Rebecca Ferguson proves her action chops as Ilsa Faust. Sean Harris was a bit unrecognizable, making him an apropos villain as the cryptic and cold, Solomon Lane. I thought that Alec Baldwin was a great addition to the franchise as the zealous CIA director Alan Hunley. As always, Tom Hollander and Simon McBurney never disappoint in their small, but important roles. Also, in a supporting role are some of the most gorgeous BMWs that you have ever seen!! OMG! All in all, this was a great action flick and well worth seeing, especially if you enjoy the genre. It was exhilarating to know that Tom does his own stunts in the Mission movies, if not all, much to the chagrin of insurers. Nevertheless, I do wish that I had not seen so much of Tom hanging off of that plane in advance, as it took away a bit of the thrill for me. But, just a bit. See it in the theater! Recommendations: If you like this, rent Ghost Protocol and Knight and Day. Your Turn: Rogue Nation was set up for a sequel, of course. 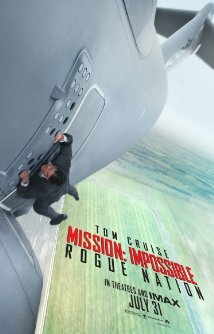 Would you see another Ethan Hunt / IMF mission? What are your thoughts?